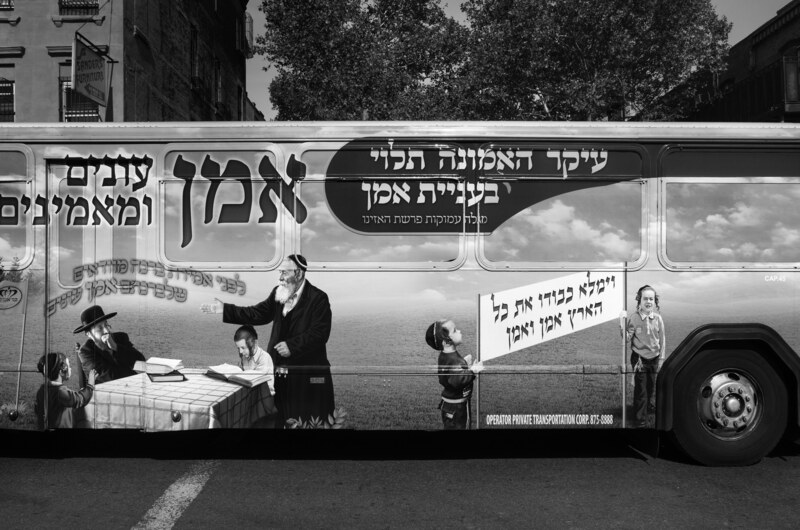 A resident of Brooklyn’s South Williamsburg neighborhood for more than twenty years, William Castellana documents the life of the fastest-growing segment of the Jewish population in New York City, the Hasidic Orthodox community. In thirty-three black-and-white street photographs, the artist provides a glimpse into a very different American reality—an anachronism within a city that’s too busy to slow down. An all-embracing Orthodox subculture that emerged as a mystical, populist alternative to traditional Judaism in the eighteenth century, Hasidism landed in South Williamsburg just after World War II, when Jews fleeing Europe took refuge in the United States. Since then, time seems to have stood still. Immune to the rapid gentrification of North Williamsburg, now a prime bar-hopping destination rife with galleries, upscale fashion, creative cocktail spots and hip restaurants, life in the neighborhood’s south side unfolds against the backdrop of strict rules, deeply rooted religious customs and traditions and dress codes that originated in nineteenth-century Eastern Europe. Teenage boys with sidecurls, men wearing the traditional fur hats (shtreimel) and long, black coats and women with high necklines and skirts that cover them down to their ankles are only some of Castellana’s subjects, which he captures in unposed, street portraits as he sneaks into a close-knit community that speaks Yiddish, eats Kosher, resists technology and trusts their rabbi as a political and religious authority. “William Castellana: South Williamsburg” shows through July 23 at the Loyola University Museum of Art, 820 North Michigan.